TERRY GROSS, HOST: This is FRESH AIR. I'm Terry Gross. Jazz singer Cecile McLorin Salvant has a new album, and we're going to hear my interview with her. I love her voice and her repertoire, which ranges from jazz standards to forgotten old songs, show tunes and originals. Salvant was described in The New York Times as the finest jazz singer to emerge in the last decade. She won best vocalist in the NPR Music Jazz Critics Poll last year, as well as in 2013 and 2015. Her new album is called "The Window." We're going to start with our jazz critic Kevin Whitehead's review of the album. Kevin says this one has the smallest cast of musicians of any album she's made, but her voice is as big as ever. (SOUNDBITE OF SONG, "I'VE GOT YOUR NUMBER") CECILE MCLORIN SALVANT: (Singing) Well, my sweet chickadee, I've got hot news for you. I've got your number. I know you inside out. You ain't no Eagle Scout. You're all at sea. Oh, yes, you brag a lot, wave your own flag a lot. But you're unsure a lot. You're a lot like me. And I've got your number. KEVIN WHITEHEAD, BYLINE: Cecile McLorin Salvant has a wide vocal range and pleasing tambour, clear enunciation, charm, good taste, quiet wit, a sense of the dramatic, a knack for finding obscure tunes - a lot of virtues for one singer. Her new album, "The Window," a duo with pianist Sullivan Fortner, leaves her voice more exposed than ever. It presents this jazz singer in the role of superlative cabaret singer, one of those supper club chanteuses who sing familiar standards and seek out overlooked material like jazzy tunes by pop or soul singers or songs from forgotten musicals. MCLORIN SALVANT: (Singing) Tell me why you make me feel this way. Could you be the one I dreamed I'd love someday? Tell me why we ever came to kiss. In my dreams, it never happened quite like this. WHITEHEAD: I love the way she quacks the word like there, not taking herself too seriously. "Tell Me Why" from 1947 by Saul Chaplin, Betty Comden and Adolph Green from a show that didn't make it to Broadway. 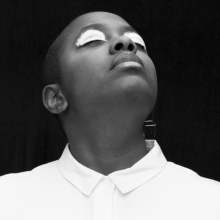 Cecile McLorin Salvant can treat a tune with kid gloves, make you hear it's beauty. But she's no stranger to blues' feeling. MCLORIN SALVANT: (Singing) So what can I say? I've got it bad, and he's gone to stay. I'm gone. I'm like a king without his throne ever since the one I love's been gone. MCLORIN SALVANT: (Singing in French). WHITEHEAD: Where some jazz singers treat a song as a launching pad, an excuse to get going, Cecile McLorin Salvant drills down into the song itself, getting it to the story or philosophy of the words. She's so good at that, a couple of breezy lyrics here seem like easy pickings. Anyone can sound smart singing Larry Hart's "Everything I've Got" or Oscar Hammerstein's "The Gentleman Is A Dope." Her offbeat selections aren't always whimsical. The album starts with Stevie Wonder's song "Visions." MCLORIN SALVANT: (Singing) I'm not one who make-believes. I know that leaves are green. They only turn to brown when autumn comes around. I know just what I see. Today's not yesterday. And all things have an ending. 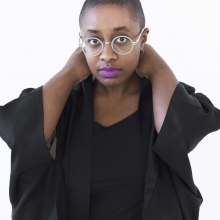 WHITEHEAD: With her laser-like focus, Cecile McLorin Salvant can get pretty intense at times. And there are moments when she pushes her amazing voice a little too far, not least on a few pieces recorded live at The Village Vanguard. On "The Peacocks," saxophonist Melissa Aldana sits in, and there's one raucous episode where she and the singers slide out of sync. In a way, those glimpses of the road to excess make McLorin Salvant's music more riveting. As a character in a movie once said, that quality of personal danger is what makes a star a star. The risks involved make her successes all the sweeter. GROSS: Kevin Whitehead writes for Point of Departure and is the author of "Why Jazz?" 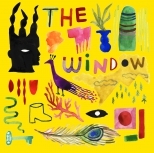 Cecile McLorin Salvant's new album is called "The Window." We're going to hear my interview with her. She was exposed to a lot of different music growing up in Miami, with a father who's from Haiti and a French mother who was born in Tunisia and lived in several African and Latin American countries. We spoke in 2015 after the release of her album, "For One To Love." Her recordings have always had some surprising choices, like this one, "Stepsister's Lament," from the Rodgers and Hammerstein musical, "Cinderella." MCLORIN SALVANT: (Singing) Why should a fella want a girl like her, a frail and fluffy beauty? Why can't a fella ever once prefer a solid girl like me? She's a frothy little bubble with a flimsy kind of air, and with very little trouble, I could pull out all her hair. Oh, oh, why would a fella want a girl like her, a girl who's so unusual? Why can't a fella ever once prefer a usual girl like me? Her cheeks are a pretty shade of pink, but not any pinker than a rose's. Her skin may be delicate and soft, but not any softer than a doe's is. Her neck is no longer than a swan's. She's only as dainty as a daisy. She's only as graceful as a bird, so why is the fella going crazy? Oh, why would a fella want a girl like her?